Shopping for a new combo smoke and carbon monoxide alarm for your home? This month, we’re shining the spotlight on one of our top combo smoke and carbon monoxide alarms, the BRK Photo Smoke/CO Alarm. This hardwired photoelectric smoke and carbon monoxide combination alarm meets new construction requirements, offering your home an additional level of safety. With its patented Optipath 360 technology, this alarm provides 360 degrees of direct access to the unit’s photo smoke sensor, meaning you’ll be alerted to potential hazards sooner. The latching features of this smoke detector make it especially appealing. The alarm latch remembers which unit initiated an alarm and visually identifies the unit with a low battery condition, which means no more searching the house trying to figure out which smoke alarm is chirping. On the topic of chirping, this smoke detector has one other feature you’ll love: two silence features. With the push of a button, you can silence the low-battery chirp for eight hours or even temporarily silence an unwanted nuisance alarm. The spread spectrum horn tone on this unit also makes it perfect for seniors’ homes, as the tone is easier for elderly with normal, age-related hearing loss to hear the alarm. With a seven-year warranty, you can feel confident that this combination smoke and carbon monoxide alarm will keep your home safe for years to come. 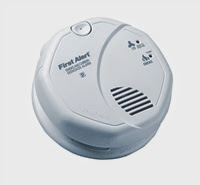 What features do you look for in a smoke and carbon monoxide alarm? Let us know in the comments! If you’re like most homeowners, the New Year has probably got you thinking “How can I update my home this year?” Since we spend so much time in our houses, it’s important to make them comfortable and useful spaces that we’re proud to show off to friends, family and neighbors. If you’re looking for a little inspiration, we’ve pulled together some of the top home design trends in 2015 so you can find the best home improvements for your space. Revamped Kitchen Cabinets — It’s difficult to overstate the difference new kitchen cabinets can make. Whether you’re partial to more traditional wood cabinets or modern sleek cabinets, swapping out your kitchen cabinets can help you have the kitchen of your dreams without spending an arm and a leg. Backsplashes — From glass and tile mosaics to stone, there are so many options when choosing a backsplash for your kitchen and bathroom. Backsplashes are often overlooked when redoing a kitchen, but these can be a great focal point and an easy way to tie a room together. 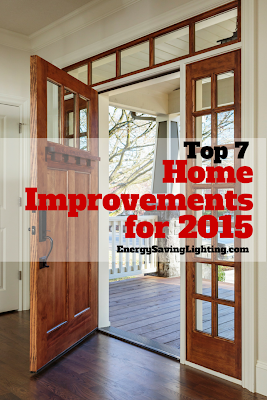 Efficient Lighting — If you haven’t made the switch over to LED light bulbs yet, 2015 is the time to do it. In addition to giving off a warm light and positive energy in your home, LED lights reward you with lower energy bills every month. Don’t think you’ll have to give up the features you love from the old technology, though: Today’s LED light bulbs come dimmable and multicolored, so you’ll have no shortage of options. Walk-in Showers, Separate Bathtubs — Many homeowners are turning toward large, luxurious, walk-in showers in 2015. However, don’t give up on getting a nice bath yet: Large, stand-alone soaking tubs are also taking center stage this year. If you’re lucky enough to have a large bathroom that gives you the spa-like experience of your dreams, consider taking advantage of both of these trends this year. New Flooring — Two of this year’s biggest trends are flooring related: engineered hardwood floors through much of the house and feature floors in bathrooms or kitchens. While you’ve probably always dreamed of hardwood floors, feature floors are likely a little more mysterious. Feature floors are often patterned tile that makes a statement and draws the eye. Ease of Use — What’s the point in updating your home if it’s not going to be more useful? Many homeowners are planning to take a few small steps this year to embrace universal design, which is the concept of making a home better suit its occupants’ specific needs. For some, this may be additional storage space, for others it may include making space easier to access with undercabinet lighting. New Coat of Paint — If you’re looking to make a big impact for the smallest price possible, don’t overlook how paint can transform a room. Some of this year’s top colors include Mediterranean blue, neutral grey and olive green. How do you plan to update your home in 2015? Let us know in the comments below!